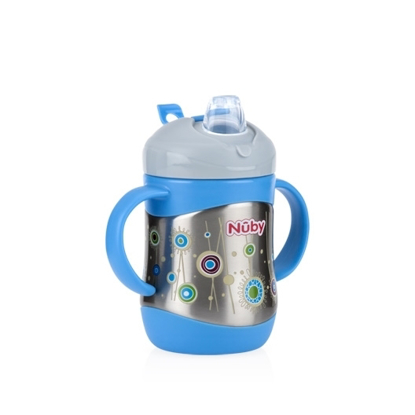 Nûby’s Flip-it™ range of cups offers leak proof technology that you can see and hear so moms and dads won’t have to worry about spills and leaks! The NEW No-Spill™ Stainless Steel Insulated Cup with its colorful two-in-one cup design not only keeps liquid cool; it also helps protect furniture from a "sweating" cup. This cup features a soft silicone straw, which is gentle to child’s tender gums and emerging teeth. The soft silicone straw is covered by an easy-to-use flip top cap. This uniquely designed feature protects the spout from contamination when not in use. Great for travel and short trips! Flip cap keeps spout sanitary and clean. 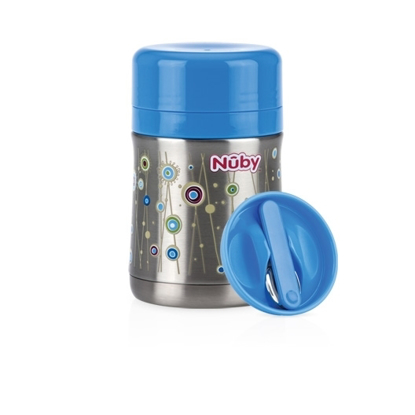 When child is ready to use the cup, press the button on front of cup and flip the cap back to expose the straw.